Issued in a 2CD-jewel case with fold-out insert and cover artwork of all releases printed. 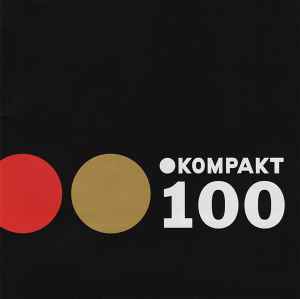 Kompakt celebrates its 100th release with this marvelous double CD packed with quality tracks. After lots of ambient stuff and a mediocre superpitcher album this is a very welcome return to form and easily the best Kompakt release for over a year. The principle of Kompakt 100 is that the "Kompakt-All-Stars" remix their favourite tracks from the rich Kompakt history. The result is more thrilling than that approach may sound at first. Its not really fair to mention stand out tracks as each and everyone is way above par. But lets do it anyway: The Tobias Thomas & Michael Mayer rework of Ulf Lohmann's Because is the track of the year for me. They produce a beat that is pure magic. Its necessary to at least mention the Wasserman Mix of Robson Ponte and Jonas Bering's work on Intershop. Great work. In addition to simply being a compilation of great tracks Kompakt 100 also brings together the minimal tech house with the ambient side of Kompakt. While their ambient releases tend to be a bit too creamy sometimes the tracks nicely round up the album giving the two CDs a structure and dramaturgy and thereby an extra quality that makes the whole even more appealing than just the sum of its parts.